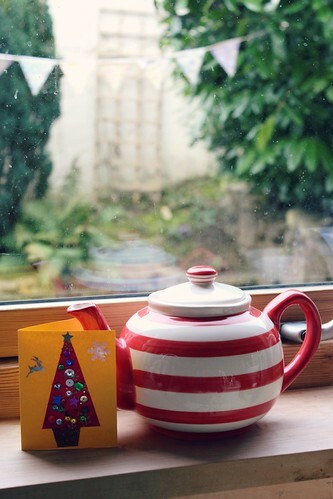 I can only think of one obviously stripey thing that I have, my teapot. This is my Sidmouth teapot, it's red and white coastal stripes remind me of one of my favourite places in the world to be. I admire it while I wash up. I always forget to use it. But it looks nice on the shelf. I'm wondering if there is a cafe named the Sidmouth teapot? I think there should be. I'm wondering how it is that another year has gone by without me visiting this quaint seaside town where my Mum used to live. I need to remedy that next year. I don't want to lose my connection with Sidmouth, and my second home feeling. Last night was the night of christmas card making and Pearl Harbour watching. Followed by a late night christmas card list wobble. It was an emotional rollercoaster. I feel like there are people on my list who it now feels quite static with. I'm not sure how I feel about that, or what to do about it. I have been doing so much clearing and cleaning out and as I look through my list of people I can't help but feel like this is also an extension of that. To keep or to let go and perhaps make room for new connections or to try and revitalize some existing ones. What I am finally realizing is this. People I have been calling family, that there has been no live connection with for a few years are really relatives. Not family. This is different. It's taken years to work that one out. Family can also be friends. Friends can also be family. Step-family which I call family, but are no longer on the radar at all, as the connecting person is sadly departed are not family, they are actually past. Sad but true. I don't want to take away the past, which had it's good moments. But they are not part of the now. So if there is so much less family than I actually thought, there are indeed some vacancies! and I think it's okay to acknowledge that and not keep that space full with family that isn't. So how do we keep our christmas card list feeling vital and alive, and a reflection of the people who are really in our lives? I think this year I was scared to face this list because I knew it was going to change and I was going to have to acknowledge this. I can't keep doing the same old same old. That's not living, it's not actually even fun, and I want to send my christmas cards out with a burst of fun, knowing they will spark some joy in a place that we both feel is alive. Oh my goodness, so true. As The Husband has lost both parents this year I feel relieved (yet guilty) that there are 'family' members that I (nearly put we, but truly mean I) do not have to see Ever again. The relief is an interesting sensation. I have culled the list once before, and there are question marks against some names this year too. I have distant (in miles) relatives that barely know me and my children since my father passed away 23 years ago and I have not kept up with (sad) due to life circumstances, and that is a shame. And I have nearby relatives that I don't care for much as they are older and all male. I am closest to my cousin's wife and people who don't know us think we are sisters. I have few female relatives at all, but am blessed with many girlfriends who bring me joy and I love to give cards too. Christmas is a hard time when all is not quite well. I may steal your teapot, a joy to behold. I believe life is naturally this way, people come into our lives for a reason, always... but sometimes, that reason is short lived. I don't think that we have to completely shut them out, but sometimes... Keeping them at arms length is healthy. I love the striped tea pot! Oh and I love the heading of your blog! I don't know. For a few years I actually didn't send Christmas cards early at all and waited to see who sent them to me and (this is a horrible thing to say) what sort of cards they sent. If they didn't send me a card in the second or third year then I don't feel I need to keep in touch with them. I also didn't worry about people who didn't send nice cards; by which I don't mean big and expensive, but cards that had good pictures on. I don't want to be the candle relative, or the holly leaf friend. Hard, but it helps me to recognise the ones that want to keep in touch with me! this was quite funny, but I do know what you mean. That's the problem with the charity bumper boxes. All those decisions are too much! I have been thinking about something along these lines. I have the beginning of a list for facebook messages instead, maybe some emails or some kind round robin. The times are definitely changing. Nice to choose a charity instead and let them know. Good thinking. I like how you said to keep or let go and perhaps make room for new connections. That is exactly what I had to several years ago. my blood family is not a loving, functional one. My family consists of my kids, grandkids and a few friends who I know will always be there for me. It is hard at this time of year to realize that some relationships that should be solid are not. But, my family, the ones I call when I need a shoulder to cry on, are the ones I hold close to heart. I honestly do not send cards or gifts because I "must" or "should" do that- I just follow my heart and do what I "feel" and what makes me feel a deep joy inside. If the recipients don't return cards/gifts but I feel a great and deep joy sending them to those people, I do; otherwise, I don't and I don't ask myself the reason why, so I avoid judgement or resentment. I also go freely and without a list- what comes natural is always a good choice, in my opinion. To someone really special, I send a card and a long letter.